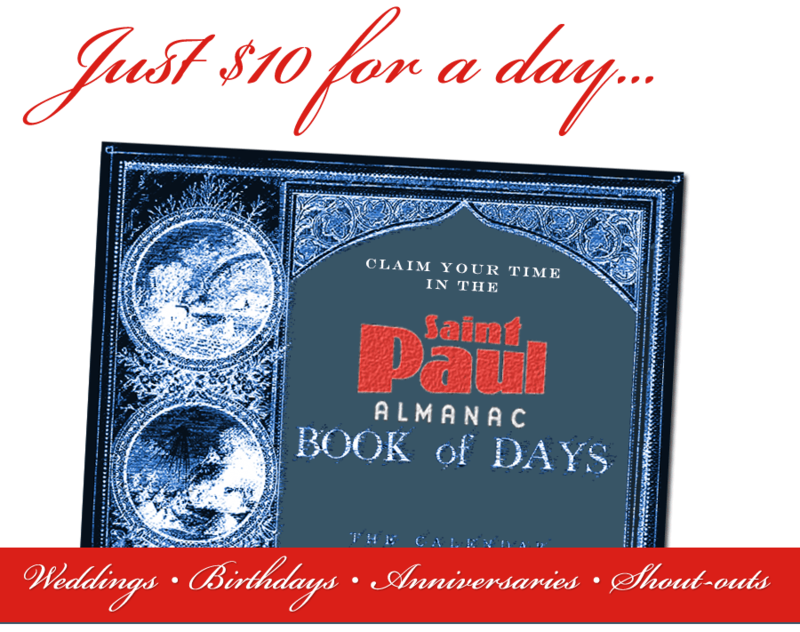 Buy a day (or week or month) in the Saint Paul Almanac‘s “Book Of Days”! For $10, your dedication or shout-out will be immediately entered into the Almanac‘s online Saint Paul Calendar, and will also appear in a special location front and center on our homepage, as well as on every page of our website during the timeframe you purchased. Your name will additionally be listed as a donor in the 2014 Saint Paul Almanac. Highlight, celebrate, and commemorate a friend or other loved one’s birthday, wedding, anniversary, graduation, or other life-changing event. Know someone who loves Saint Paul? Someone who can’t get enough of arts and literature? Someone who celebrates all things local? Donate for one day for just $10! Celebrate an entire graduation week for $70! Forgot someone’s birthday? Heh heh. The month package is yours for just $300! Whether motivated by pure love or a deservedly guilty conscience, the community-building mission of the Saint Paul Almanac is strengthened either way. Sign up for the Almanac‘s “Book Of Days” now. Time is running out!